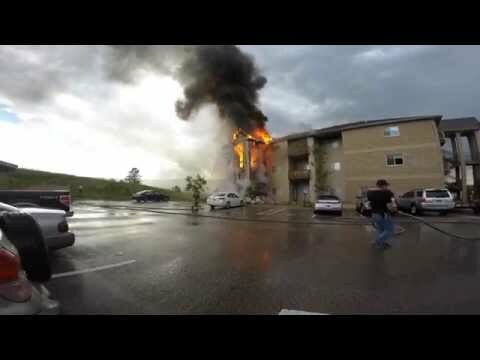 This apartment building in Rapid City, South Dakota, caught fire and when Spencer Butler and his friends arrived to get some video footage, they quickly realized that the fire department wasn’t there yet and that they could help. Butler and his buddies went from door to door with the building in flames checking for trapped people and pets. While everyone managed to get out, Butler and an acquaintance had to kick down a few doors in order to save 3 dogs. Reports out of Rapid City indicate that there were no injuries to pets or people, and the Rapid City Fire Department was able to get the fire under control after arriving. This guy goes to my 24/7 gym and is always hanging out in the workout room but never lifting. Just saw this on a friends Facebook and wow it all makes sense now!